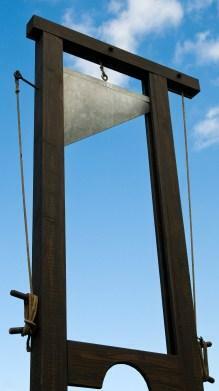 The Reign of Terror in the French Revolution was a very dark period in French history. There were no official records kept as to how many nobility and "traitors" died by the guillotine; however, some estimates run as high as 40,000 people. La terreur during the French Revolution can be considered akin to a pendulum swinging in reaction to a force. Whereas the nobility in pre-revolutionary France was taken with grand spending and propagating the state wealth while leaving commoners with nothing, the Reign of Terror is often considered a paranoid reaction of purging. The riots that essentially began the official period of the French Revolution did succeed in overthrowing the monarchy and, as such, established a body for legislation. However, there were several factions, two of the most powerful being the Jacobists and the Girondins. Eventually, the Committee for Public Safety was established and was effectively the government of France during the Reign of Terror (1793 to 1794). It came under the leadership of a powerful and radical Jacobin named Robespierre. While it was clear that France would need to set up a new form of government, the Committee for Public Safety was not the answer that a Revolution-hungry France was truly seeking. The Committee, run by Robespierre, assumed that anyone of nobility had no sympathies towards France or her people, and consequently should be put to death. Many were killed simply by associating, or having ties with, someone of nobility. The justification was that anyone who was with nobility was clearly against the 'people'. While truly is was no one single person responsible for the Reign of Terror in the French Revolution, the one name that is often synonymous with this period of instability brought on by the cause and effect chain of the French Revolution is Maximilien Robespierre. Ironically, he was executed by the guillotine, as a fitting punishment for those who he had executed during the brief period in history. So influential was he over the Reign of Terror, that his arrest and execution in 1794 effectively ended the period. He was largely influenced by Enlightenment thought from writers such as Rousseau and Montesquieu. The Committee of Public Safety did quite a lot in the short time that it reigned. One of its first acts was to create what was known as the Maximum Price Act, a law that helped establish the maximum price of necessities such as grain. The idea was that by forcing necessities to be sold at more reasonable prices, legislation would be counteracted. However, the opposite happened. People began hoarding grain and other necessities to avoid having to sell them at low prices. The Committee also essentially created a war dictatorship, which in turn caused thousands of nobility and French elite to flee for their lives. They also created the Law of 22 Prairial, which essentially eradicated the right of a defense, allowing the legislative branch to execute so-called traitors more quickly: without a fair trial. It seems odd that the Republic whose motto is égalité, liberté, and fraternité went through such a truly violent period of history. People such as Marie Antoinette, Louis XVI, Madame Rolande and even Antoine Lavoisier all lost their lives to the guillotine. Robespierre, as well as several other leaders, also lost their lives to the guillotine and the Reign of Terror ended to give way to a more just French government.